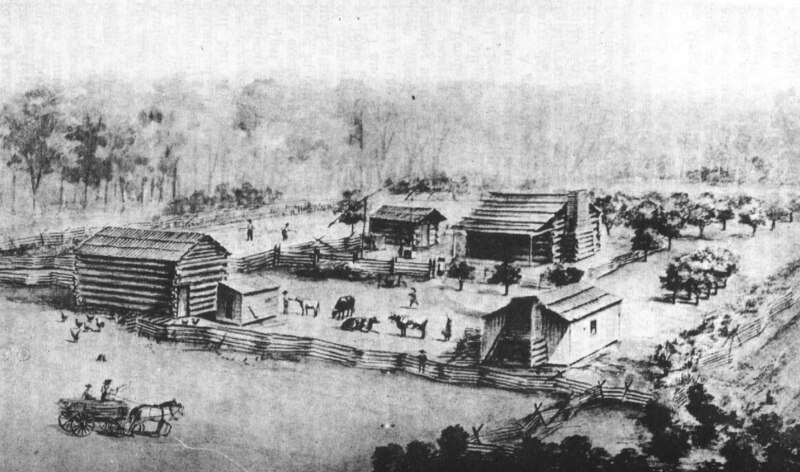 From the 1914 History of Madison County, Indiana by John Forkner, this drawing, entitled Pioneer Settlement by artist Berry, depicts major elements of a pioneer farm: the log house and barn, the split rail fence, the orchard in the back, workers tending a crop in a cleared field, a child feeding a calf, the well with wooden crane next to the shed, as well as cows, chickens, and a farm wagon being driven through a pasture. The smokehouse in the bottom right corner and hog house in front of the barn are the only structures made with planed lumber. The surrounding dense forest is also evident in the background and right foreground. Thomas Hiday, 1828-1908, grandson of pioneer Dr. Jacob B. Hiday, built this brick home after returning from the Civil War. 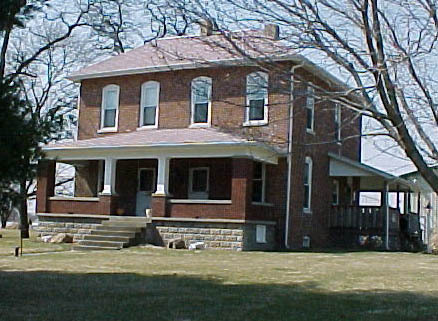 The house is just west of SR 13, along Reformatory Road, one of the oldest "traces" in central Indiana. It sits on land settled by the Hiday family, overlooks Lick Creek from the north, and is pictured at right on the first day of spring. The second settler was Samuel Holliday who came from Kentucky in 1822 and purchased land in the south-central part of the township. Mr. Holliday was "a man of superior attainments," which meant that he had acquired higher education. He became an associate judge and presided at the 1824-5 trial of the men found guilty of massacring innocent Native Americans. His sons William and Joseph went on to serve as a Presbyterian minister and as a soldier and state legislator respectively. Abraham Cottrell was among the earliest arriving from Ohio in 1823. Abraham, his wife Sarah, their nine children, and Abraham's parents John and Elizabeth lived on a homestead between Fall and Lick creeks. John Cottrell was a veteran of the War of 1812. Three of his grandsons, William, Samuel and Thomas--Abraham's sons-- were veterans of the Civil War. Among the other pioneers was Richard Kinnaman, a native of South Carolina, who came in 1825 and has the distinction of planting in 1826 the first orchards and later in 1840 of building the first distillery. 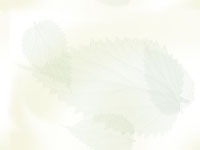 Richard's relatives William and Hiram also settled in Green Township during its early development. Very prominent in the pioneer community was Capt. William Nicholson from Ohio. The captain settled in the northwest sections of the township and in 1844-5 built the first tannery which was in section 21. For the Mexican War in the late 1840s, Capt. Nicholson recruited and trained volunteers, but the conflict was over before their services were required. During the Civil War, William Nicholson was still an involved military leader, acting as captain of a company of state militia which helped guard Indiana from Confederate Captain Morgan and his raiders. James Scott, John and William Huston, William Williamson, Samuel Gibson, Elijah Bolinger, and John and Charles Doty were settlers as of 1833. Education was important to settlers of the early 19th century. Schoolhouses were built second only to churches. The first schoolhouse in the township was constructed of round logs in 1829. Round logs were more primitive than hewn, shaped ones. John Wilson was the first teacher, and for eight years, the youth of Green Township were taught during the winter months the basics of "readin', writin', and 'rithmatic." This first schoolhouse was replaced in 1837 with an improvement: the second schoolhouse had square logs. Families continued to settle in Green Township, and by 1858 there were five different schoolhouses accommodating around two hundred children. Twelve pioneer cemeteries are listed in this township: Anderson, Beech Grove, Cottrell, Doty/Emment, Fausset, Hiday, Jones, Kinnaman (destroyed), Mt. Carmel, Nicholson, Pleasant Valley/Pleasant View/Valentine, and Smithers. Many of these family burial grounds are located along the old Indiana Highway, now named Reformatory Road. This was one of the first state roads cut into the wilderness. Back in pioneer days, a road was any trail or path or route "traced" by hash marks cut into the trees of the surrounding dense forest. For that reason, these routes were also called "traces." For many years, the Indiana Highway was the only trail between Pendleton and Indianapolis and as such acquired a large number of early settlers and therefore many pioneer cemeteries. 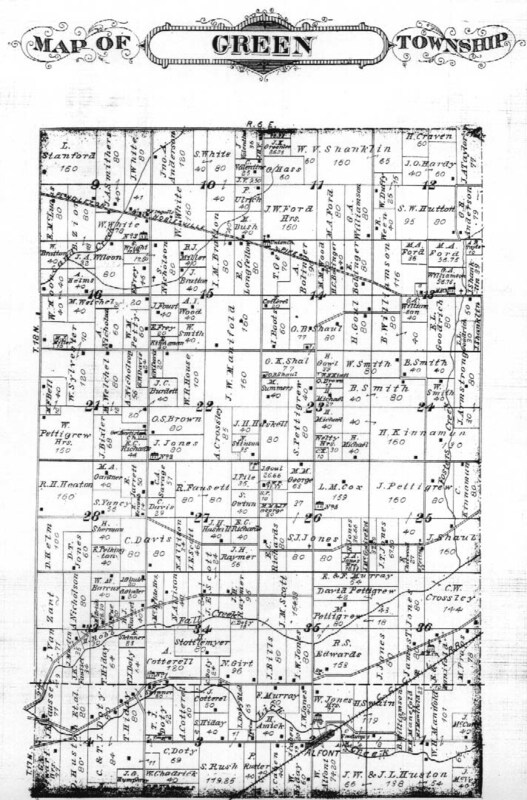 Below, the 1876 plat map for Green Township clearly shows the Indiana Highway running between Fall Creek and Lick Creek. Along the north bank of Fall Creek can be seen another old pioneer trace. Second and third generation Hidays, Dotys, and Hustons still own the land, and farther north the Nicholson, Williamson, Wilson, and Kinnaman families are still represented.